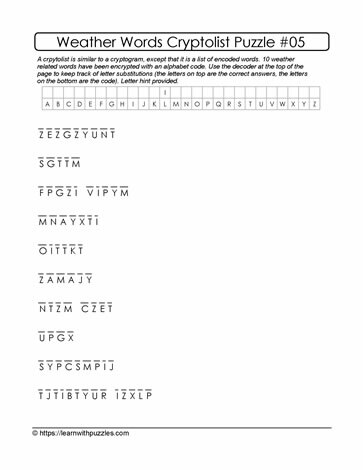 This weather cryptolist puzzle contains a list of 10 words encoded with different letters of the alphabet. To solve the puzzle, decode the list of words by starting with the letter hint from the chart. In this case, substitute the letter |L| with the letter |I|. Next, try to identify at least one word and then using the known letters, continue to decode the rest of the list of words. All the words are weather related (e.g. weather, climate change, global warming). Puzzles support problem solving strategy development, vocabulary building while keeping the brain engaged.